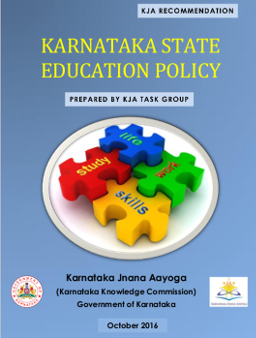 Sriranjani Ranganathan was invited to be a member of the ‘Research Group on Teacher Education of the Task group - Karnataka State Education Policy’, set up by the Karnataka Jnana Aayoga (Karnataka Knowledge Commission), Government of Karnataka to develop the recommendations for the Karnataka State Education Policy. Our inputs on the need to create forums (professional learning communities) of teachers and to support teachers to create and share content, as a part of their in-service training, is part of the document. 34.1. Teachers need to be assisted to make maximal use of digital educational resources available on the Internet, and to contribute towards creating educational resources of their own. They must each be given a laptop with Internet connection and be provided with training on how to create educational content on their own as a key part of in-service training. expertise. Some examples include contributing to all the activities of the SEC such as contributing to inducting technology appropriately, creating digital content, evolving norms for accreditation and ratings, evolving new teaching and learning pedagogies, and evolving processes for better administration, among many others. They must be supported with resources and forums where they can meet their peers on a regular basis. 51.3. Communities of practice need to be created for different groups of teachers. The successful experiment of using technology to build fora for teachers in secondary schools needs to be replicated in the area of higher education. 51.4. A professional body for teachers, similar to the Medical Council of India for example, one that can license teachers for practice, help oversee their career development, and provide support to practicing teachers through offering a forum for interaction needs to be created. The State government should help seed such an organisation.